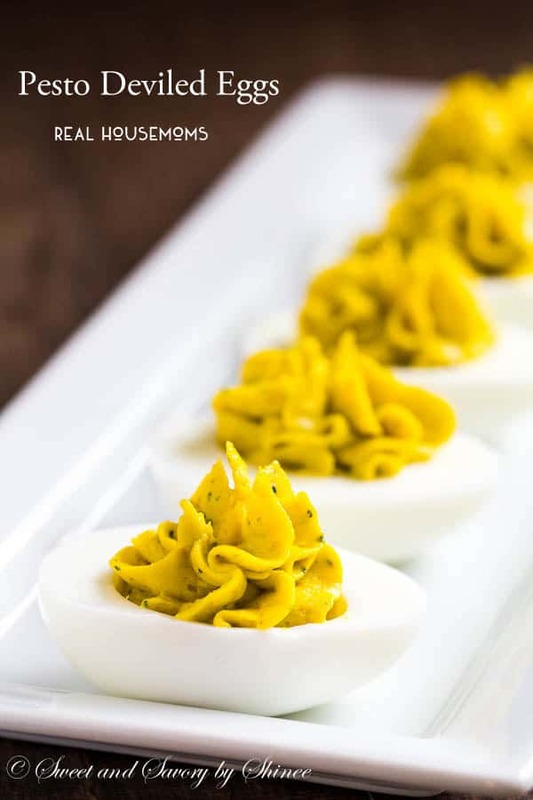 These creamy flavorful pesto deviled eggs are super simple and require only 3 main ingredients. Spring is in the air. Easter is just around the corner. And all sorts of delicious deviled eggs recipes are popping up everywhere. I love deviled eggs. They are so easy, versatile and delicious. 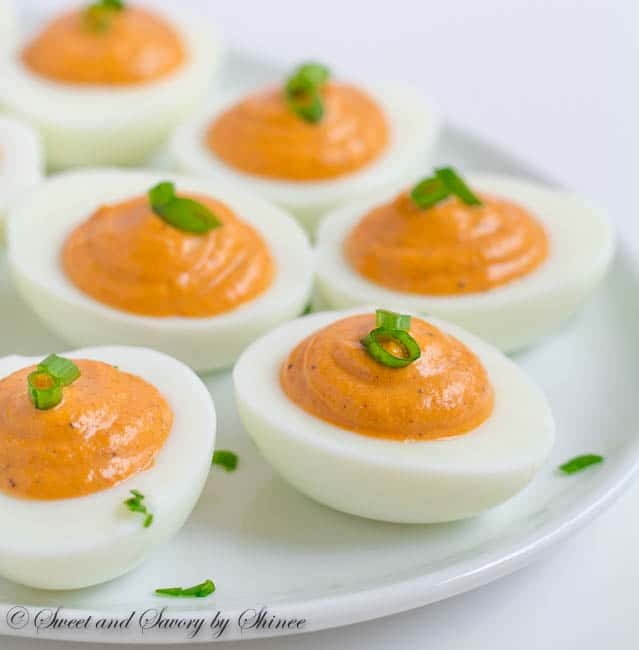 You can make them as complicated as my chicken liver pate deviled eggs (<-I also shared my secret how to easily peel hard-cooked eggs here. 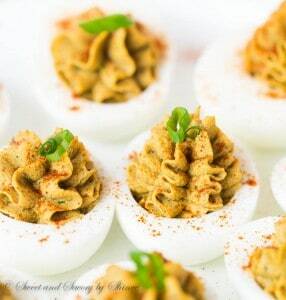 ), or as simple as classic deviled eggs. 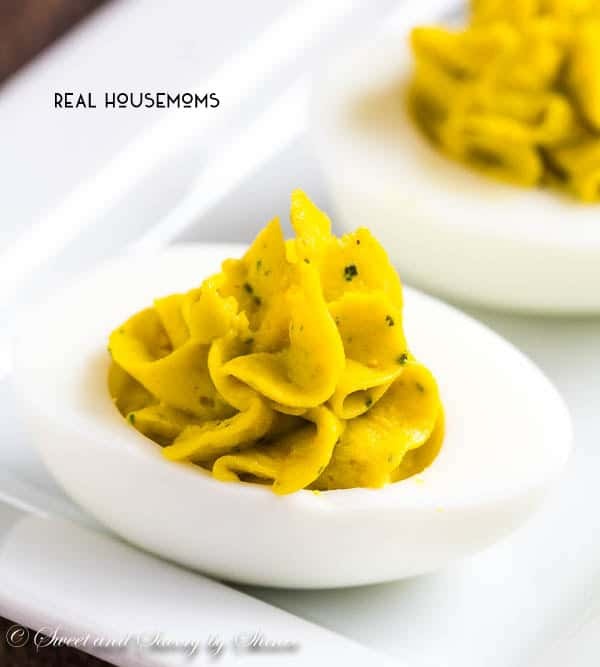 Today, I’m sharing with you one the simplest of deviled eggs, yet one of the most flavorful. All you need is a good pesto. I used a homemade basil pesto in this recipe, and it was a huge hit in my family. Hope you will give this recipe a try to use up all your Easter eggs. In a medium saucepan filled with water, place the eggs and bring it to a boil over medium high heat. Once the water boils, reduce the heat to medium and simmer for 15 minutes. Using tongs, remove the eggs from hot water and place them into a bowl filled with cold water. Let the eggs cool completely. Carefully peel the eggs and cut in half. Remove the egg yolks into a small bowl. Smash the egg yolks with a folk. Add mayo and pesto and mix well. Salt and pepper to taste and transfer the mixture into a pastry bag with star tip. Pipe the filling into the egg whites. Serve immediately.